Mary is also remembered by members of the Priory Church choir. A friend and fellow chorister recalls her always smiling, kindly and dressed immaculately – especially in the summer – in pretty dresses and white gloves. She was a soprano, singing in the choir and until she left Edington to be cared for. Another Friend remembers Mary and her husband, Jurek, being great cooks and entertainers, recalling especially being invited to Christmas one year and the special, rather romantic atmosphere they created. 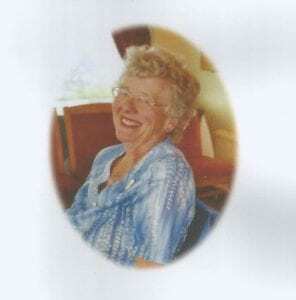 Her working life was as a primary school teacher, but she was also a good golfer and Lady Captain of Warminster Golf Club at one stage; she loved the local countryside too and enjoyed walking. She had been instrumental in helping the Friends grow into the society it is today and in so doing ensuring the Priory Church would continue to be maintained as the special place so many know and love. Thank you to Friends who helped write this tribute.